What fortune does your future hold? Click here to play! Are you going to be rich beyond your wildest dreams? Will you be famous? Will you beat everyone else in the karate tournament to prove you're the best? You can never know for sure until you’ve lived it, but The Oracle slots offer you a peak into a future where you are fabulously wealthy. 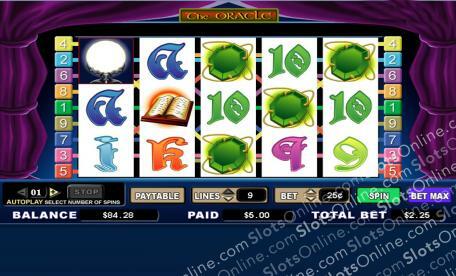 Featuring tarot cards, crystal balls, ancient tomes, candles and The Oracle herself, this slots game is a mystical adventure offering the kind of money that could help you to decide your future for yourself. If you close your eyes and see a time when you are rolling in the dough, then spin The Oracle slots and wait to see what your destiny will be. The Crystal Ball symbol is the scatter, paying out on the total bet when 2 or more land on the reels. It also triggers free spins when 3 or more land left to right or right to left on the reels. 3 trigger 5 free spins, 4 trigger 10 free spins, and 5 trigger 15 free spins. All prizes are tripled on free spins. The Oracle symbol is wild, and substitutes for all symbols except the scatter. It only appears on reels 2, 3 and 4. Auto spin can be set from 1 to 99 times.